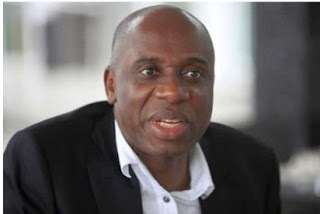 Home / NATIONAL / NIGER DELTA / POLITICS / Can Amaechi pull this ‘stunt’ for Buhari? It is arguably the boldest move to reconnect the south and the north regions of the country. But it is a project that the promoters are not keen to make much noise about, at least for now and understandably, for strategic reasons. The chief promoter of the project is Mr. Rotimi Amaechi, for now the minister of transport who is also quietly organising President Muhammadu Buhari’s second term aspiration. It is perhaps for the latter reason that Mr. Amaechi is not saying much about the Warri – Itakpe railway project, albeit in public. As manager of Buhari’s first successful presidential campaign which was heralded with much expectation, albeit many of them yet to be met, Mr. Amaechi is understandably, silently hopeful of springing this railway project as a card to silent critics and perhaps deliver Buhari for a second term. So when the minister alongside officials of the Ministry of Transportation, Nigerian Railway Corporation and the contractors handling the project undertook the 326 kilometer train ride from Itakpe to Warri, the anxiety of the minister was very visible. The six second class coaches and one first class coach that were used for the ride can take a total of 584 passengers. The fully air-conditioned coaches have toilets, each passenger has a drawback table, and there is also provision for electric sockets to charge phones or laptops. Of course to the ordinary eye as is expected of every sincere public official, the minister’s enthusiasm for the completion of the project was repeatedly transmitted to the contractors handling the passenger stations. The first railway line of 52 kilometers was initially conceived to transport iron ore from Itakpe to the Ajaokuta Steel Complex, which was conceived in the seventies to produce flat steel sheets for the country and the rest of the world. That project which is estimated to have gulped billions of dollars after reaching about 95% completion has, however, remained moribund since the early eighties, it being a relic of the country’s failed project management culture. Even before the 52 kilometers was put to use, the contract for another 274.8 kilometers was awarded for an additional rail line to link Aladja, Warri with Itakpe. That railway line was built to transport super iron ore concentrate from Itakpe to Aladja Steel Complex which would turn them into billets the raw material and returned to Ajaokuta to produce flat steel sheets. That railway project which was started in 1985 and completed in 1998 has only been put to partial use mainly on account of the non completion of the Ajaokuta Steel Complex. It was not until the present administration came on board that Mr. Amaechi thought it fit to use the rail line for passenger traffic and hence the decision to build stations and platforms that would make such possible. 13 stations were designed between Itakpe as Station One and Warri as Station 13 and it was the progress on the work on the stations that Mr. Amaechi alongside ministry officials and some journalists went out to see last Friday, July 27. Reflective of the squandermania that is replete with Nigerian culture as the touring party arrived Itakpe about – kilometre from Lokoja, labourers from the Chinese company CCECC were seen replacing the wooden slippers on the rail tracks. The wooden slippers are the connections laid between the parallel steel tracks. Over the years due to lack of use and maintenance the wooden slippers had wasted making that portion of the rail tracks unfit for use. The wooden slippers were being replaced by concrete slippers which are expected to last longer. The minister’s travelling party left Itakpe at exactly 10:57 a.m. making the first stop at Ajaokuta where the minister inspected work on the ongoing station. Officials of the CCECC who are handling the project were ill at ease by the urgency he brought to bear on them on the project. He was particularly not happy that timelines set for the completion of the project were unnecessarily being extended by the contractors. Besides CCECC, ZTE another Chinese company is also involved in the handling of the signals for the project. At Ajaokuta, a local chief could hardly hold his excitement that at least part of the dreams of his community in the construction of the Ajaokuta Steel Complex was coming to live. The chief rained showers on President Muhammadu Buhari praising him for making the realisation of the project a possibility. A major design failure that was, however, spotted by the minister was the absence of a station in Lokoja, the Kogi State capital. It was his opinion that the absence of a station in Lokoja did not make sense as a Lokoja station would make a good transition point for those coming from Warri going to Abuja. The minister after ordering that the Itakpe-Warri rail line be converted to allow passenger train service had apparently left the design of the train stations to ministry officials who did not see the logistical wisdom of putting a station in Lokoja. By the design of the project managers, a train station was to be put every 30 kilomters between Ajaokuta and Warri. Presently, there are train stations in Ajaokuta, Itakpe, Agenegbode, Owa-Oyibu near Agbor, Abraka, and Warri among others. Though many of the stations are named after the major cities near them, they are all out of the cities. Mr. Amaechi was particularly unhappy with that. He was especially unhappy with the decision to build some of the stations on lands that needed to be sand filled as he saw it as a waste of taxpayers’ money. “Why did you not site the stations on flat lands,” he pressed at Uromi even as he complained that it was far from town. The CCECC officials, however, explained that the platforms and other facilities were designed well ahead of the order to use the train track for passenger traffic. Mr. Amaechi’s concerns nonetheless, the experts were, however, enthusiastic that the rail project would sooner than later bring developments to the surrounding communities. “Towns develop to meet the railways and sooner than later development would spring up in the communities around the train stations,” one CCECC official said. By the design the Itakpe – Warri train can travel at a speed of 120 kilometers per hour and when fully rehabilitated at 150 kilometers per hour bringing the prospect of travel between Lokoja and Warri to under three hours. With speed and safety assured, the prospect of reconnecting the country’s North and South is one that Mr. Amaechi was very enthusiastic about. That nonetheless, the enthusiasm of the minister to deliver the project could not be mistaken. It was a project that he did not promise ahead of 2015, but it is the joker he is going to throw on the country ahead of the 2019 campaign. Indeed, as the travelling party arrived the last station in Ujevwu, near Warri, he was met by community leaders who had turned out with drums and in colourful attire to appreciate the administration’s effort in putting to use, a project that had laid prostrate for more than 30 years. The enthusiasm of the Waffi boys and girls who stormed the train to take selfies inside the train coach was overwhelming. One of the Warri boys tying only his wrapper around his waist who gave his name as Esse Sunday kept on saying, thank you Buhari continue for 25 more years, continue for 25 years! What a pity Amaechi did not hear him as the exhausted minister had by that time stepped down. Surely his sleep would have been sweeter if he had heard the refrain of the boys!